This is a guest post by Jan Fichtner, Postdoctoral Researcher in the CORPNET project at the Department of Political Science of the University of Amsterdam. So far, International Relations and International Political Economy have not dedicated much attention to analyzing the group of the Anglophone countries together (notable exceptions are Andrew Gamble, Jeremy Green, Kees van der Pijl, and Srdjan Vucetic). Instead, the vast majority of IR and IPE approaches treats the English-speaking countries and jurisdictions solely on the grounds where they are located geographically: the Unites States and Canada are grouped as ‘North America’, Australia and New Zealand are seen as part of ‘Asia-Pacific’, the British dependent territories of Bermuda, the Cayman Islands, and the British Virgin Islands (which all act as important offshore financial centers) are usually categorized under the heading ‘Caribbean’, and finally most analyses treat Ireland and the United Kingdom as part of ‘Europe’ or the European Union. The latter is going to change in the coming years as a slim majority of Britons has voted for ‘Brexit’. Therefore, the UK will eventually leave the EU, although the details of this historic divorce are far from clear. This comes after many years of widespread skepticism against the EU and continental ‘Europe’, which has been fueled constantly by many British politicians and certain Australian-American-owned media outlets. In a recent article in the Review of International Studies (free access through August 2016), I have argued that the Anglophone countries generally have much more in common with the other English-speaking states than with neighboring countries – Peter Hall and David Soskice as well as Bruno Amable have found indications that the Anglophone economies form one distinct socio-economic model. Moreover, the English-speaking countries are deeply integrated by their extremely close cooperation in the highly sensitive field of signals intelligence (the so-called ‘Five-Eyes’), which is unparalleled in the world. Thus, it makes sense to analyze the Anglosphere countries together. This is especially pertinent in the pivotal field of global finance. The illustration shown above is a novel visualization of the positions that different countries occupy in international financial markets. The graph combines the three major segments of cross-border finance (i.e. excluding domestic holdings): portfolio investment, direct investment, and banking claims, thus for the first time showing the ‘big picture of global finance’ (which has amounted to an astonishing US$82 trillion in 2012). It becomes visible quite intuitively that the Anglosphere countries dominate contemporary global finance – notwithstanding the fact that they have been the epicenter of the global financial crisis that threatened to cause a new Great Depression in 2008. 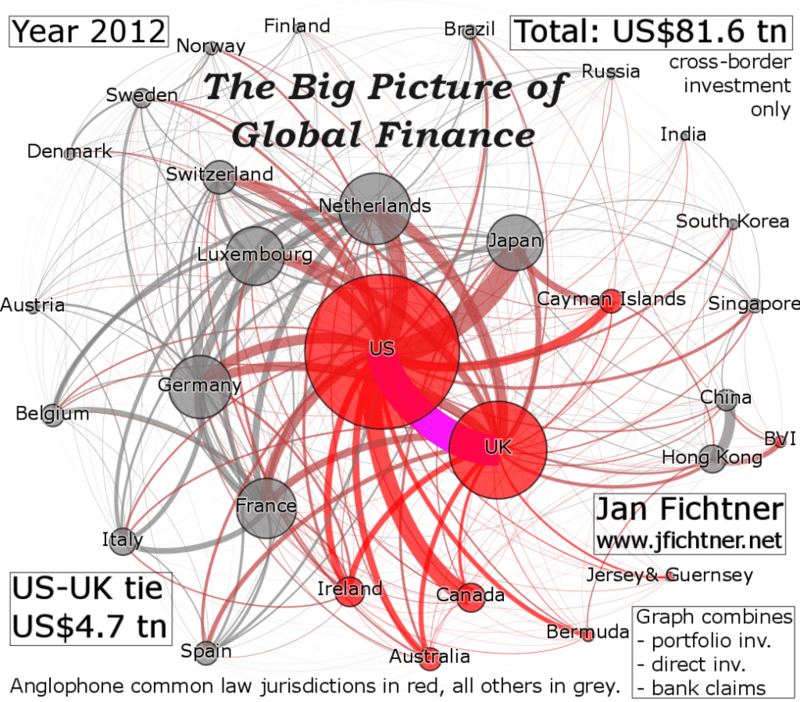 In addition, the visualization shows the strong intra-Anglosphere financial ties – the US-UK connection (shown in magenta) is the largest bilateral financial tie in the world with US$4.7 trillion. The major finding of my paper is that the Anglosphere enjoys persistent ‘structural power’ in global finance, thus supporting similar findings by William Kindred Winecoff concerning the position of the United States in the post-crisis global banking system. My conclusion is based on the analysis of nine key segments of global finance including derivatives and foreign exchange trading, foreign exchange reserve holdings, market capitalization of publicly listed corporations, external bank deposits, as well as direct and portfolio investment. Furthermore, the paper presents an analysis of the huge segment of financial wealth (US$165 trillion in 2014, more than two times global GDP). The illustration below shows a remarkable development: the share of the Anglosphere countries in global GDP has declined more or less constantly from about 40% in 2000 to 33% in 2015 (the so-called ‘rise of the rest’). 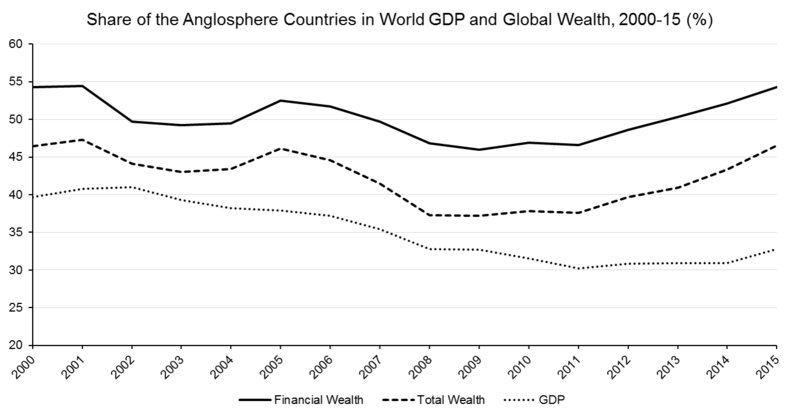 However, the share of the Anglosphere in total financial wealth has recovered from a nadir of 46% in 2009 back to 54% in 2015 – the exact share it had in 2000. Paradoxically as it might seem, the global financial crisis has not entailed a reduced role of the Anglosphere in global finance; on the contrary, the crisis led to a rebound. The growing gap between the shares in world GDP and global wealth is also due to the globalization of dominant American corporations as argued by Sean Starrs. I argue that in the field of finance the primary decision-making power is located in NY-LON, an apt term used by Dariusz Wójcik for the two dominant and intertwined global financial centers New York and London, where the most important financial actors and institutions are based. NY-LON is embedded in the two central Anglosphere countries in finance, the United States and the United Kingdom. Private financial actors have significant influence in both countries – through the revolving doors between Wall Street and Washington and via party donations (in fact, the financial sector, especially hedge funds, has been responsible for the majority of donations to the Tory party as revealed by Nick Mathiason). Around this core, there is a group of crucial Anglosphere offshore financial centers, or tax havens, which fulfill subordinate functions to NY-LON. These offshore jurisdictions include the Cayman Islands, Bermuda, Jersey, and Ireland (the main destination of ‘inversions’ by US corporations). Arguably, these common law tax havens enable Anglo-American financial actors (such as hedge funds and private equity funds) and large corporations to gain advantage in international markets. In addition, they facilitate the free flow of capital from around the world to NY-LON. Finally, Australia and Canada represent the outer layer of the financial Anglosphere; both do not act as tax havens but play a much more prominent role in international finance than the vast majority of economies with a comparable size. In this way they help to sustain the open global financial order created any dominated by the United States and the United Kingdom. One of the most important questions that politicians, academics and pundits are thinking about at the moment is how Brexit will affect the status of the City of London as one of the two dominant global financial centers in the world alongside New York (‘The City’ by Tony Norfield is an insightful analysis of London’s role). While it is certainly too early to draw definite conclusions, it seems plausible that the negative effects for the City will be significant but not as fundamental as some believe. Saskia Sassen has argued that the network of complex functions that London performs in many key segments of global finance is unlikely to migrate to competing European cities such as Amsterdam, Dublin, Frankfurt or Paris. Some symbolic actions might be undertaken by the EU to shift the clearing of euro-dominated derivatives to the eurozone, but more drastic measures seem very improbable. In fact, I think it is entirely possible that in the end the EU and the UK agree on a deal that includes a few highly symbolic changes for the British electorate (i.e. some kind of limitation on immigration) but that also largely maintains access of UK-based financial actors to the EU. It will be very interesting to see how agreements in trade and financial services between the UK and the other Anglosphere countries will develop. Before the referendum the Obama administration said that the UK would be at the ‘back of the queue’ for any trade deals but soon after the vote for Brexit it emerged that senior officials from both countries had already held preliminary discussions on the matter. In the end, Brexit could make the powerful yet often hidden ties that bind the UK to the Anglosphere much more visible to pundits, politicians – and to IR and IPE scholars. Great to see this post, Jan! Secretly hoping you’re now working on a paper on the spatial distribution of inversions involving the world’s top companies.